Nuts play an integral role in German food, especially baked goods and candies. The most common nuts used are hazelnuts and almonds. Chestnuts and, to a lesser extent, black walnuts are also popular. Hazelnuts are less expensive than almonds and are used in candy and cake fillings. Learn about hazelnuts in Europe. Hazelnuts ("Haselnüsse") have been an important food source throughout Europe since the Mesolithic (5,000 to 10,000 years ago). Right after the last ice age, they became the main forest tree, eventually being succeeded by the beech forest. They grow as a bush or small tree in moderate temperature zones in the entire northern hemisphere. Once considered nuts for peasants (compared to almonds which were reserved for the wealthy in the Middle Ages) hazelnuts are now as coveted as almonds. In North America, Oregon grows the most hazelnuts. 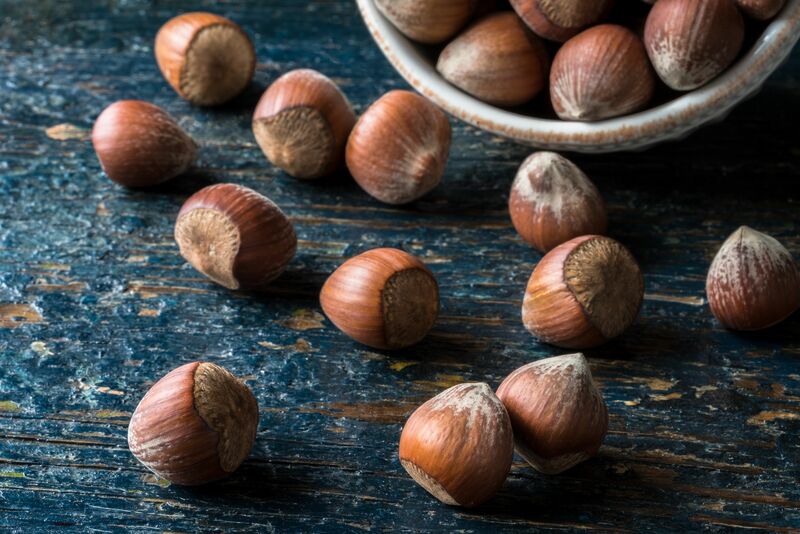 In Europe, most hazelnuts are imported from Turkey and Italy, although the plant grows in sub-alpine areas of Germany and is a popular bush in gardens. Hazelnuts, also known as filberts, are traditional symbols of life and fertility, immortality, Spring and fortunate beginnings. Hazel branches are commonly found in both heathen and Christian burial sites. The forester's and judges' white staff was made from hazel wood. Hazel was thought to protect against snakes and witches and was used to douse for water as well as buried treasure. Hildegard von Bingen was unimpressed with the hazel, "The hazel is a symbol of salaciousness, it is worthless for healing ministrations." "in die Hasel ​gehen" (to go into the hazel bushes) means to meet clandestinely. "Viel Hasel, viel Kinder ohne Vater," is a folk saying meaning, "lots of hazel, lots of children without fathers." "der ist aus einer Haselstaude entsprungen," ("he came from a hazel bush") is a euphemism for an illegitimate child. Hazel has also been used as an aphrodisiac; the bark ground and mixed in food or hazelnut oil consumed. Hazelnuts are used in many modern, industrialized foods. Nutella, Ferrero Küsschen, Mozart Kugeln, Duplo, Knoppers and Toffifay are popular candies. Nut nougat (also known as Gianduja) and Krokant use hazelnuts as an important part of cookies and cake fillings. "Nussschnitten" - an airy, hazelnut filling inside a sweet crust. "Chocolate Chip Cake With Cherries" - a sponge cake with nuts, chocolate, and cherries. "Nussecken" - Christmas cookies - rich, buttery crust with a tender, nut topping baked on. "Vanillekipferln" - crescent - shaped cookies with ground hazelnuts. Hazelnut nougat ("Haselnussnougat") is a 200-year-old specialty from Piedmont (Italy). It came about from a cocoa shortage caused by Napoleon increasing import taxes on the South American beans. To make a small bit of chocolate go further, roasted, ground hazelnuts were added to the "Chocolate Capital of the World's" wares. This creation had a nutty - sweet aroma and a very nice texture and quickly became as popular as the chocolate it came from. The name, gianduja (pronunciation - zhahn-DOO-yuh), comes from a Piedmont carnival figure, a farmer who likes wine, food, and girls. How it became known by its more common name, nougat, is not clear. It might be related to the Latin for "nut cake" ("nux gatum"), or from the French for "you are spoiling us" ("tu nous gâtes"). Nougat also represents another form of candy, a boiled sugar mixture with whole nuts similar to divinity. The nut nougat is soft, like butter, and can be melted and used for candy fillings, and decorating or coating cookies and cake. It is not easy to make this at home because special "Roller Refiner Machines" are used to crush and mix the nuts until the oil comes out and creates a smooth texture. You can try to do this with a food processor or, as they did originally, with a mortar and pestle. But it is very hard to get a smooth product. This means you will need to buy "Nussnougat" for your projects. Unfortunately, in the United States, small blocks of this candy are not readily available in grocery stores, as they are in Germany. It is used in the candy - making industry, however, and can be purchased in several - pound blocks from the following sources. See also Chocosphere.com or World Wide Chocolate for couverture and gianduja bars. If you need to substitute for nougat, try using block chocolate couverture with added hazelnut flavoring. These little, chocolate coated candies were famous for being the first, perfectly spherical sweets ever sold in Europe. Paul Fürst created the candy in 1890 in Salzburg (Austria). It has a core of pistachio marzipan which is covered in a layer of nut nougat (gianduja) and then dipped in chocolate. The balls are placed on sticks, then dunked and allowed to dry by setting them upright, on the sticks. The stick is then removed and the hole filled with chocolate couverture and the balls are wrapped in a blue-silver wrapper. This handwork technique is used at the Fürst company even today. There are many imitators, since the name, "Mozartkugel" was not trademarked. Mirabell, in Austria, Reber in Germany and Nestlé in Switzerland, all make versions of this tasty treat. While the candy was named after Mozart, the composer, Mozart lived approximately 100 years before that (died December 5, 1791) and never had the pleasure of eating one of these bonbons. Also known as "croquant" (French) or "Knuspergebäck" (German), "Krokant" is a mixture of chopped nuts, most often hazelnuts, and caramelized sugar. Butter is used in many recipes. In German cooking, "Krokant" is chopped fine and used as a decoration for sweets, baked goods, ice cream sundaes. Less often it is left in large pieces and consumed as a confectionary. You usually purchase 8-ounce packages in the baking aisle of the store in Germany, already chopped. "Butterkrokant" is made when the butter and sugar are caramelized together. The brittle has a softer consistency then. "Blätter or Mürbekrokant" is made when the warm candy is rolled out and spread with nougat, then folded together again. This creates layers like a puff pastry. It also has a very fine texture and is a bit crumbly. Contrary to nut nougat, "Krokant" can easily be made at home. Use this basic recipe for "Krokant" which was then used to decorate a Frankfurter Kranz. Nutella is the brand name of a chocolate and hazelnut spread sold by the Ferrero company which originated in Piedmont. Related to gianduja, it is softer than the hazelnut and chocolate loaf used for cooking. It has been sold since 1964 and recently entered the US market and can be found near the peanut butter in regular grocery stores. Nutella is used as a spread for bread, but it can be an excellent filling in baked goods or yummy in pastry puffs. You can make your own hazelnut spread. Here is one recipe and here is one for the "Vollwertküche." Also, check out this cool list of Nutella candy recipes including truffles and fudge.